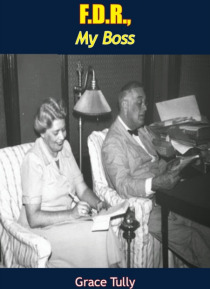 Few people had the opportunity to know Franklin Delano Roosevelt as Grace Tully did. For nearly seventeen years, twelve of which were spent in the White House, she was his private secretary, and she saw him not only in his office but also in his home, during working hours and during moments of relaxation, coping with momentous issues and enjoying the company of his friends and family. It was a rar… e and rewarding opportunity, for F.D.R. was a fascinating and tremendously important person.First published in 1949, Miss Tully has written a unique account of what it was like to be in daily association with him, so that through the pages of her book you may come to know F.D.R. as she did. Which means that you will know him not only as a historic figure but also as an individual human being, a man with likes and dislikes, with moods and whims, with hopes and anxieties such as all men have-and with courage, determination, an faith that all men do not have.Here are first-hand, behind-the-scenes stories of campaign tours, of tense election nights, of processions and inaugurations and vital meetings. Here are accurate, intimate impressions of the many famous and colorful personalities who were relatives, friends, associates, opponents, advisers-Eleanor Roosevelt, Harry Hopkins, Wendell Millkie, Ed Starling, Dwight Eisenhower, Harry Truman, to name but a few. And here are revealing and entertaining anecdotes about the members of royalty, the prime ministers, the diplomats who made Tully's office seem indeed a crossroads of the globe.With affection and respect, Miss Tully has drawn a picture of a man of integrity, warmth, vitality, humor, generosity, and courage-and a man, also, of great religious faith. She has not taken it upon herself to make historic judgments, for this is after all a personal narrative. Her book is humble, human, and gracious. It is also vital, distinguished and unforgettable.